ToolsSDKs, IDE Toolkits, Command Line Tools, and Developer Tools for AWS. DevOpsTooling and infrastructure resources for DevOps. Power & UtilitiesImprove customer service and accelerate innovation in the power and utilities industry. Data AnalyticsUse Data Analytics to analyze vast volumes of data quickly and at low cost. Unified CommerceReliable, scalable, and secure data storage and warehousing services. Customer EngagementUse machine learning, facial recognition, & other AI capabilities to bring intelligence to applications. AWS for AutomotiveBuild connected, autonomous & digital automotive brand experiences in the cloud. BlockchainShared ledgers for trusted transactions among multiple parties. Telecommunications on AWSAccelerate innovation, scale with confidence, and add agility with cloud-based telecom solutions. Amazon GameLiftAmazon GameLift: Simple, fast, cost-effective dedicated game server hosting. Knowledge CenterGet answers to frequently asked technical support questions. AWS Key Management Service (KMS) has integrated with AWS CloudHSM so you now have the option to create your own KMS custom key store. 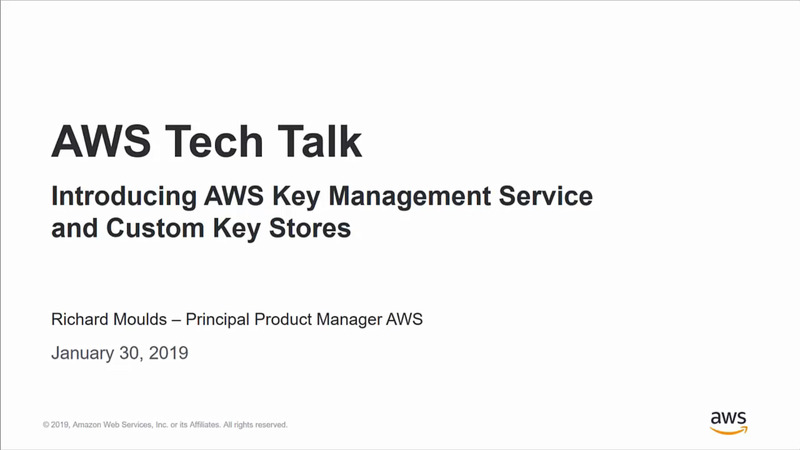 In this tech talk, you will learn more about how a KMS custom key store is backed by an AWS CloudHSM cluster and enables you to generate, store, and use your KMS keys in hardware security modules (HSMs) that you control. We will review AWS KMS and dive into the new custom key store feature. You will also learn how it helps satisfy compliance obligations that would otherwise require the use of on-premises HSMs and supports AWS services and encryption toolkits that are integrated with KMS. Intro body copy here about 2018 re:Invent launches. Here's a link to download your slides. Interested in more AWS Online Tech Talks? Check out our upcoming schedule.